Allway Sync detects when folders are removed from one device and removes them from any other corresponding synchronization targets..
Allway sync use light resource usage, the software has an average features comparing to other software, but have an excellent customer service . 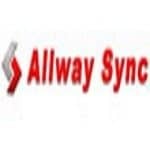 Allway Sync has a good file sync and Backup features, with the new enhancement make it one of the best sync software in the market, such features provide enhanced data synchronization services. Data replication between multiple computers or with a removable drive allows you to use and modify those files when and where you want: at home, in the office, on a business trip, etc. As an added bonus, you get data backup with no extra effort. With the new Allway sync engine, the sync job can specify a set of more than two folders to be synchronized. Just use the basic interface to define the first two folders in the synchronized set. To add extra folders to the set just navigates from the profile-window menu-bar to the Job|Advanced|Add Sync Folder menu item.. .